What is the Google Pixel 3? Google’s third attempt at a Pixel phone is its most successful yet. The Google Pixel 3 is an excellent device with a nice display, truly stunning camera and the best version of the Android software. It’s a big jump from the Google Pixel 2 and a worthy rival to Android stalwarts like Samsung Galaxy S9, LG G7 and OnePlus 6T. You can pre-order the Google Pixel 3 now, with devices hitting stores on November 1. Google Pixel 3 prices start from £739/$799 for the 64GB model and £839/$899 for the 128GB version. A decent amount of data for moderate users. A low upfront and monthly cost brings the TCO down to just £991. Perfect for heavy data users, especially with absolutely nothing to pay upfront. It’s worth noting that this is a cashback deal, so the monthly cost is based on once you’ve redeemed. Previous Pixel devices haven’t been lookers. They’ve been functional rather than fashionable; durable rather than delicate. The Google Pixel 3 is the first entry that feels like a match for the iPhone XS and Samsung Galaxy S9. 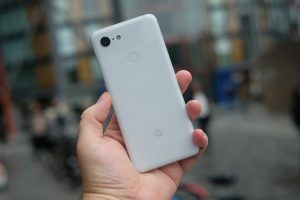 From a distance, and especially in pictures, the Pixel 3 looks just like the Pixel 2. Pick it up, hold it and then you’ll notice the difference. The back is now smooth, constructed completely out of glass and almost soft to the touch. It has the finish of a heavily polished pebble and slips comfortably into your palm. Instead of just putting glass on the back and stopping there, Google has split the look of the glass: the top portion is shiny, with the lower area matte. I love the matte finish here – it’s most noticeable on the white and pink versions – as it reduces smudges and adds some of the grip often lost when glass is switched to metal. This is still a slippery phone though, especially if you’re coming from a Pixel or Pixel 2, and being glass means it is less resistant to drops. 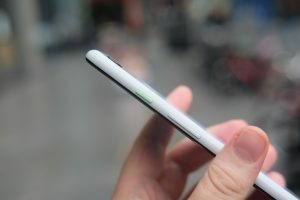 I’ve seen some other Pixel 3 users report issues with the rear scratching, something I have yet to see. However the soft back does feel like it would scratch easily and I will keep an eye on this over the next few weeks. Switching to glass also allows Google to introduce wireless Qi charging and it helps retain the IP68 water-resistance rating. A USB-C port is the only connection here – there’s no 3.5mm headphone jack – and that’s flanked by a SIM card tray. Along the right hand side there’s a clicky volume rocker and power button that, on my white version, has a contrasting mint colour. I love this hit of vibrancy even though I would prefer it was orange like the Pixel 2 XL. Having all the buttons on one side isn’t for me and I much prefer having the lock switch on its own. This is how it’s done on the iPhone XS and it means you don’t accidentally alter the volume when you want to turn the phone on. It’s a minor quibble, but one that has frequently frustrated me during my time with the Pixel 3. Flip the phone over and you’ll notice the biggest difference between this and the Google Pixel 3 XL – the screen. Aside from being smaller (this has a 5.5-inch display, as opposed to a 6.3-inch one), the Pixel 3 doesn’t have the deep notch cutting into the display. Instead, it’s an 18:9 panel with a thinner border running around it than the Pixel 2. This makes it feel a lot more modern and so much better looking. This isn’t a completely edge-to-edge display though, as two front-facing speakers sit above and below the display. You’ve also got dual selfie cameras too. 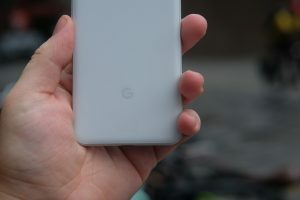 A 5.5-inch screen might sound intimidating if you’re used to the older Pixels (both had 5-inch screens) or an iPhone (typically with a 4.7-inch screen) but thanks to the slimmer bezel the Pixel 3 is just about the same size overall as those two phones. It’s comfortable to use in one hand and small enough to slip into the pocket of tight jeans or a handbag. I’d say it’s the perfect size for a phone. At 5.5 inches, the screen on the Pixel 3 is the biggest of the non-XL Pixel phones. It’s also the best. Colours are punchy and bright, with none of those murky whites that ruined the display on the Pixel 2 XL. Blacks are deep and inky too, thanks to the decision to stick with an OLED panel rather than an LCD one. OLED screen allows for pixels to be individually lit, meaning they can be turned off completely to display perfect blacks. It also means you won’t drain too much battery by using the always-on display. Resolution of the panel is FHD+ (2160 x 1080), which might cause some concern for those wondering why it’s not been beefed up to Quad-HD+ (2960 x 1440) like the Samsung Galaxy S9 and LG G7. Honestly, at this size I struggle to decipher any difference between the two resolutions unless I get unnaturally close and really look for individual pixels. This is a perfectly crisp, detailed panel and one that wouldn’t be much better with a higher resolution. Google has also added HDR support here, with compatible videos on YouTube looking truly stunning. Apparently these phones will support HDR Netflix streams too, but this wasn’t available at the time of review. Actually, Netflix won’t even play in HD on either of my Pixel 3 review devices, so that’s slightly odd. I assume an update will rectify this. Viewing angles are excellent and there’s enough oomph in brightness to see the screen outside. To my eye it’s not the brightest display around though, and you’ll probably find yourself manually altering the brightness levels a lot more than, say, with an iPhone. Google is going for an accurate representation of colours of the screen of the Pixel 3 and there’s noticeably less saturation in reds and green than you’ll find in a Samsung phone. You can tweak the screen setting slightly with Boosted, Natural and Adaptive options available. Adaptive is the default and I haven’t felt the need to change it. A very obvious theme ran throughout Google’s unveiling of the Pixel 3: specs were barely mentioned. Its thinking is that the software optimisation and how things work are far more important than flashy numbers and huge amounts of RAM. If you are interested in the internals though, here’s a quick rundown: Snapdragon 845, 4GB RAM and 64GB of non-expandable storage with a 128GB model available for £100 extra. It’s the standard spec-sheet for a 2018 flagship phone. 4GB does seem slightly meagre when there are more and more phones with 6 or 8GB, and the Snapdragon 845 is likely to be replaced in the coming months by a rumoured Snapdragon 855 with 5G support. Yet, having used the Pixel 3 for an extended period, I am not worrying about performance. This thing is fast, churning through everything I can throw at it without lagging or feeling bogged down. Games play smoothly and open as fast as any other Snapdragon 845 phone. 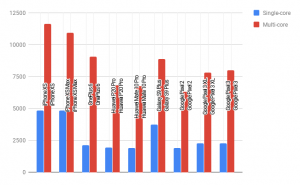 It is, however, slower than the iPhone XS when opening the same game or app – but then comparing iPhones and Android phones is virtually impossible as there are so many different factors. 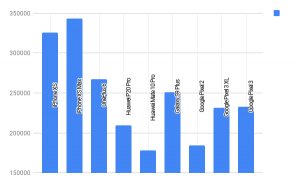 See the below charts for performance in synthetic benchmark tests. The real test for the Pixel 3 will come 12-18 months down the line. That’s when the amount of RAM could become an issue. We’ll just have to wait and see. Audio quality from the stereo front-facing speakers is truly excellent. As the sound is aimed towards you, it’s not blocked by hands when you’re watching a video and Google Assistant queries can easily be heard across a room. There’s no headphone jack here, but Google does include both a 3.5mm headphone jack adaptor and a pair of perfectly fine USB-C earbuds in the box. These earbuds look a lot like the Pixel Buds from last year and they boast some of the same translation functions too. There’s Bluetooth 5 support too, if you’re more a fan of wireless headphones. A feature often forgotten about on Android phones is haptics: that vibration buzz you get when a message or call comes through. The vibration on the Pixel 2 was very weak and the one used here is a big improvement. Google seems to know this and as a result you’ll get a lot more small haptic responses throughout the OS. There’s one when you pull down the notification panel and another when you flick through apps. With lots of other phones switching to the face unlock systems, it seems a bit odd Google is holding steadfast with fingerprint authentication. The rear sensor is ridiculously fast and I would take this any day over an in-display option that doesn’t work to unlock apps, but some form of face unlock would have been nice. 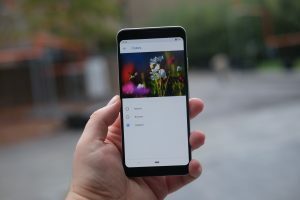 The Google Pixel 3 runs Android 9 Pie with the Pixel launcher on top, and it’s the best software experience on any Android phone. It’s certainly missing some features; a deep and customisable battery-saving mode being the most obvious to me, but the general experience is fantastic. The UI is clean and simple; fast to navigate and never overbearing. There’s the essential Google apps pre-installed and absolutely nothing else. As a user of Google services, the way everything works and syncs together is nothing short of fantastic. 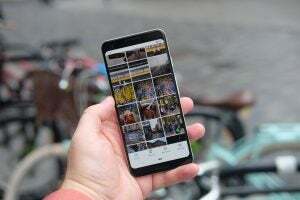 Google Photos remains the single best way to back up and store snaps, with the Pixel 3 offering unlimited full-resolution uploads to the cloud. The big Pie addition is Digital Wellbeing. This lets you not only monitor your phone usage – including seeing how many times you unlock the phone a day and how many notifications you get – but helps you curb it by blocking out certain apps during selected periods and halting notifications when you’re sleeping. Digital Wellbeing remains in beta and a full release should come later in the year. It’s quite basic, but visually it’s easy to quickly glance at your usage, and being able to limit, say, my Instagram time to an hour a day is much needed. Pie also tweaks notifications, grouping more important ones together and making them more visible, plus it ditches the traditional soft-keys for gesture-based navigation. 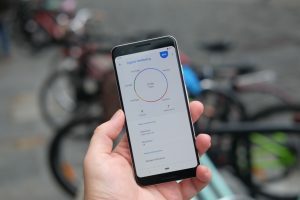 Pixel 3-specific features are kept to a minimum, and the majority of them are not yet available or restricted to the US. There’s a call-screening feature, for example, coming to certain areas of the States later in 2018, which will use Google’s Duplex AI to actually answer spam calls for you. I’ll be sure to try this out when it comes to the UK. 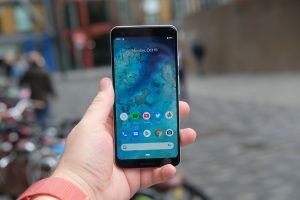 The post Google Pixel 3 appeared first on Trusted Reviews.